A hangover greeting to all. 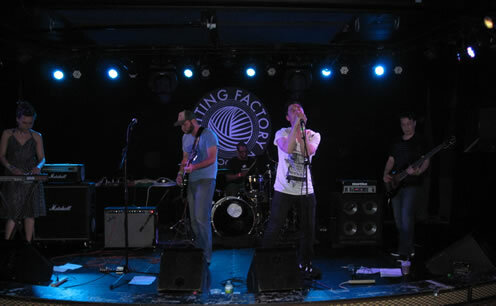 Thanks to everyone that came out to see our debut gig as Stereo Off, was a great turnout, cheers to Hotel Mexico, the Knitting Factory Brooklyn and the sound guy Rob for letting me set up recording equipment in the soundbooth. More videos, pics and tracks to come soon. For now, here’s a picture of us being replaced on stage with statues. And here’s some tracks from Friday night. Overall fun times, solid first gig. If it was Rickey Henderson, it would be a leadoff homerun with the new team. For those that have no idea who that is, he says things like this.